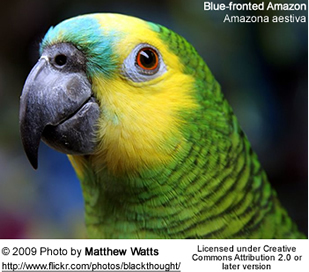 The Blue-fronted Amazon (Amazona aestiva) is also known as the Turquoise-fronted Amazon and Blue-fronted Parrot. 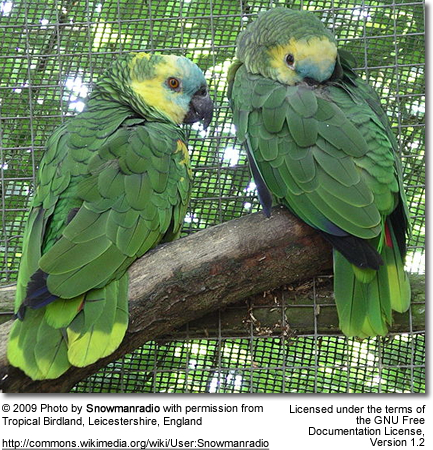 Its name derives from the distinctive blue marking over its beak. 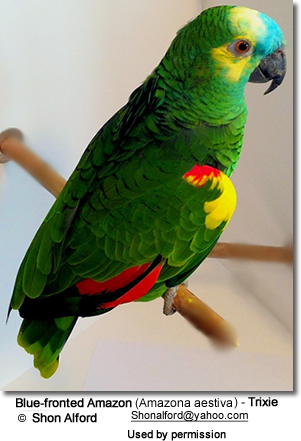 The Blue-fronted Amazon is one of the most common companion parrots, and a favorite pet bird in the United States. However, it is endangered in its natural habitat in North-eastern Bolivia, South-Western Mato Grosso, Brazil, Paraguay, Northern Argentina and Northernmost Buenos Aires. A small feral breeding population has also established itself in Stuttgart, South-western Germany. Range: Found in eastern Brazil. ID: The leading edge of the wing (also known as "shoulder") is red. Range: Found in northern and eastern Bolivia through adjacent parts of Brazil, to Paraguay and northern Argentina. ID: Generally has more yellow to the head than the nominate species and the "shoulder" is partly or wholly yellow. Even though the subspecies xanthopteryx has been treated as a separate species, they interbreed freely with the nominate species where they come into contact. 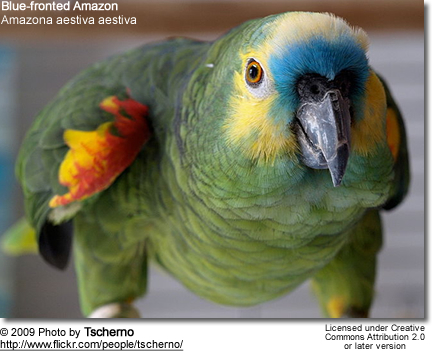 Blue-fronted Amazons average 14 - 15 inches (~35 cm) in length (from head to tail tip) and weigh 9.7 to 18 oz (275 to 510 grams) - the average being 14.1 to 15.2 oz (400 to 430 grams). A wide range of color combinations have been produced. Some birds have no blue head feathers whatsoever; others have turquoise blue on their forehead or even the whole front of the bird (face, neck and chest) is blue. 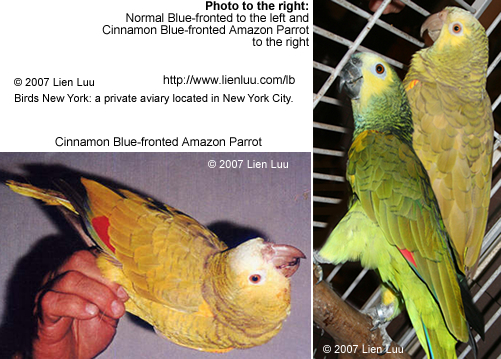 Most have yellow somewhere on their head or face; some have blue, a little white and then yellow as head markings. There are significant individual variations in both facial pattern and amount of yellow/red to the "shoulder". 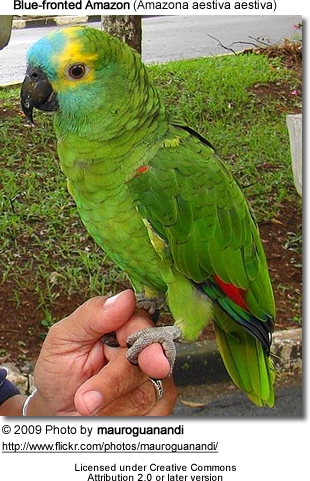 In one extreme, individuals with essentially no yellow to the head and entirely green "shoulder" are known from north-western Argentina. The beak is dark grey and their feet are grey. In their natural habitat, Blue-fronted Amazons nest in tree cavities. They generally produce a clutch of 3 to 5 oval, white eggs, which measure around 38 x 30 mm. The eggs are incubated by the female for 26 to 28 days and the chicks leave the nest about 60 days after hatching.